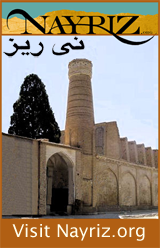 Awakening, by Dr. Hussein Ahdieh and Hillary Chapman is a detailed history of the Babi and Baha’i Faiths in the city of Nayriz, situated in Fars province, Iran. The book is a precious gift to those who love to study the lives of early Babi and Baha'is in Iran, and beyond, to all lovers of humanity. 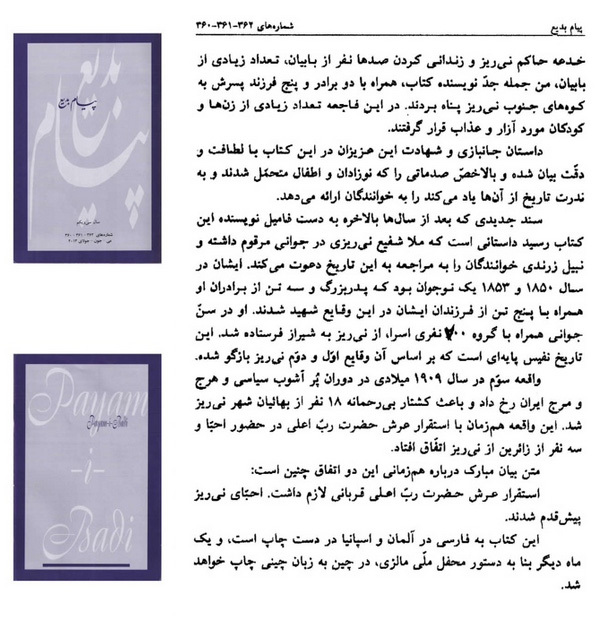 Although a brief history of early believers of the Babi and Baha'i Faiths has been published in Nabil's Narrative by Shoghi Effendi and later many other scholars, Awakening provides a unique and updated perspective. Many of the heroes and heroines of those upheavals were family members of Dr. Ahdieh. From childhood, he listened and later documented the oral stories of the challenge and triumph of the early believers who fought alongside Vahid Darabi and in other upheavals. The events in the book are described as three separate upheavals. The first upheaval took place in 1850 at Fort Khajeh outside Nayriz, where Vahid along with hundreds of new believers defended their faith and finally offered up their lives as a sacrifice. The second upheaval took place in 1853 when the Babis became aware of the vicious governor’s scheme to uproot the Babi community. A large number of them with their families took refuge in the Southern Mountains of Nayriz. After months of heroic effort against largely reinforced forces of the governor, they were killed. Old men, women and children numbering over 700 were taken as prisoners. Among them was an 80 years old man, Mulla Abdul Hussein, the author’s ancestor, whose three brothers and five sons were martyred, and two of his grandsons were among the hostages. The story of the women and children, which are rarely recorded in historical documents, are portrayed with great care and attention in Awakening. The most significant document used as reference in this book is Shafi’s diary, which was recently discovered by the author. Shafi was a grandson of Mulla Abdul Hussein, a teenager among the prisoners. Later, he recorded his eyewitness account of the upheavals. Nabil in the Dawn-Breakers refer sthe reader to this diary for more information. 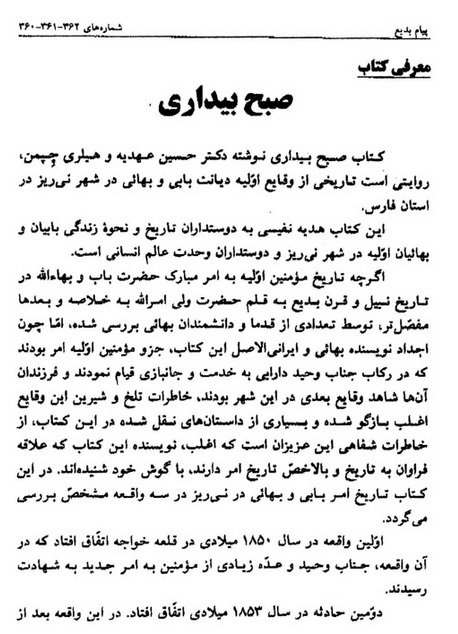 The third upheaval, in which 18 Baha'is of Nayriz were brutally martyred, occurred during the Democratic Revolution in Iran in 1909. This event coincided with the internment of the remains of the Bab on Mount Carmel Haifa. Three Baha'is from Nayriz were present. Abdu'l Baha in one of his tablets indicated that the placing of the remains of Bab in Mount Carmel needed sacrifice, the Baha'is of Nayriz won this honor.